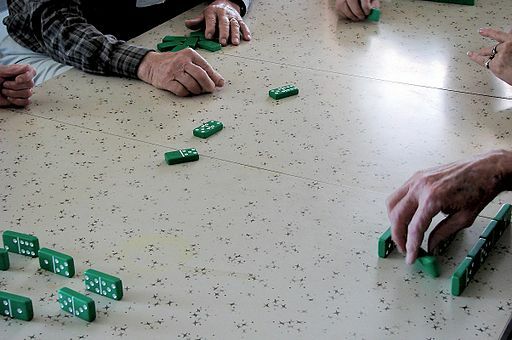 For anyone who doesn’t know what Texas 42 is, it is just the most entertaining domino game ever was invented. 42 is played with a standard double-six set of dominos. Four people divide up into two teams. Each person gets seven dominos and the object is to win enough count to make a bid from 30 up to 42, unless you double that to 84 which is two marks. Only if the bid has already gone to 84 (2 marks) does the bid go to 3 marks. The first team to win seven marks wins. But, instead of going into all the rules and strategy here, if you will just go to www.texas42.net you’ll find all you need to know to get started. There’s always been a lot of discussion, arguments, and some wars have almost been started over where the game of 42 started. There are some out-of-staters who even claim it didn’t get invented in Texas at all. Well, they are just wrong, it started in Texas, and I believe it was my grandpa who invented it. Just kidding. But Grandpa was an expert, and passed the game down to all of his children, my dad being one of those. Daddy taught us kids how to play when we got big enough to count to seven and could talk good enough to say 42, 84, and nello. Nello meant that you tried to lose every trick. Needless to say, Grandpa didn’t like nello. It took me a long time to figure out the reason why, but I think it was because he couldn’t stand to lose. I learned a lot of things playing 42, like when it becomes obvious that you’re not going to make your bid, because your opponents caught the last trick and it had the double-five or the six-four on it. That’s when you are supposed to say, “Well, that’s where Tony throwed the mule.” Grandpa taught us that, too. We used to get together in our family on Friday or Saturday nights and play 42. Some of my folks have won some of the tournaments they have back around home. Why, one reason I picked out and married the girl I did was mostly because her family played 42. Come to think of it, since 42 is the state game of Texas, I guess most everybody from there knows how to play. If you’d like to learn, got to that website I mentioned earlier, and you can learn how to bid and play and what some of the strategies are. Do you play Texas 42?